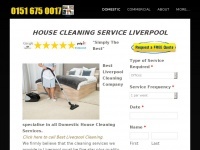 Liverpool Domestic House Cleaning Company that specialises in Homes, Apartments, Rental properties all at competitive prices. Call 0151 675 0017 for a Free Quote. Bluesparklecleaning.co.uk - Offi­ce Clea­ners Ser­vi­ces Lon­don EC1 Dartford DA1 ..